For many people, winter might not seem like an ideal time for fishing. The temperatures are dropping; many bodies of water have frozen over; and the lake itself may be so cold, that the fish have left for somewhere warmer. But, it has been proven that winter is an opportune time for fishing—it just takes knowing how to properly fish off-season. Fishing, as you might know, is often an early morning affair—the early bird gets the worm, as they say. But in the winter, that playbook is thrown out the window. On cold mornings, there’s hardly any fish in the water. So, with that being said: sleep in! You won’t have to get to the water until around 10 a.m., at least. From there, fishing until around 4 p.m. is ideal. In the winter, it’s all about hunkering down—it’ll be too cold to try several spots, if you’re not catching at one. So, do your research: before getting to your fishing spot, look online at the weather forecast and the area’s conditions. You’ll want a body of water that is calm and does not have unexpected flow predictions. The stiller, the better. 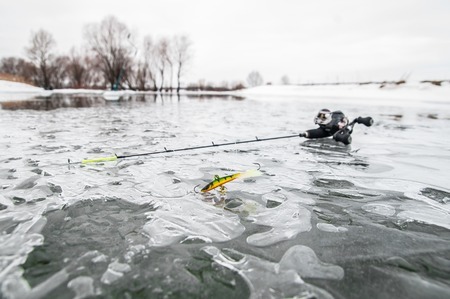 If you’re fishing in the winter, here’s a self-evident truth: you’re going to be outside for a while. So, pack and dress accordingly. We suggest heavy-duty gloves, an all-terrain jacket, long johns, and hand warmers. (But no cotton!) Because the minute the cold comes in, it doesn’t leave. With these tips in mind, you’ll be ready to take on the season like an expert angler! And at Mattice Lake Outfitters, we’re always happy to help. Check out our blog for more fishing and hunting tips and tricks!